And this is what I auditioned for today. The audition consisted of one minute solo dancing and one minute group dancing with two other people. One of the most hilarious and fun auditions ever. Do I want it because it pays well? Yes. Am I scared I might actually get it because of these commercials? Yes. Is this what I think it is? My doctor swears it was a drawing to mark the tibula and two tendons. I think they were having some fun. This is what greeted me two days after surgery when I took off the bandages. Not even nail polish remover could make it go away. I am stubborn and vain and three city blocks is an effin' long way. But my eyebrows look good. 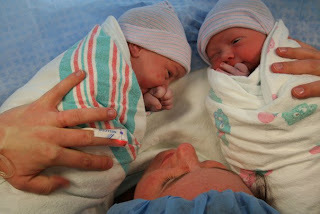 Cora and Griffin were born just before 1:00 a.m. this morning. Both babies and Erin are doing well. They are both over 6 lbs. 9 oz. This picture makes my womb ache! I'm an aunt of five nephews and finally a NIECE! We're all overwhelmed with joy. GENIUS! I just bought them in pink. ...Because only athletes get these injuries, right? After seeing my doctor (who I LOVE) today, I found out there are some significant things happening. Some of you may not know that I've been struggling with a knee injury for the past few months and just had an MRI on my knee and back. That's fun when you're claustrophobic. Please read that as sarcasm. This injury makes it hard to walk even four blocks. Two and a half months of physical therapy didn't really do the trick. 1. I have a torn meniscus in my left knee that's 7mm long. She says it's pretty big and that they need to try and repair it if possible. If they can't, they'll cut it??? 2. I have no cartilage on the outside of my knee. She says I'm pretty young to have this but it's probably because of my past injury. Three cheers for 9th grade basketball! They are going to first try to do some surgery they use on professional athletes where they drill holes in the bone and allow stem cells to grow (Microfracture?). This is usually 85% successful. If it doesn't work, we'll go about another route with a different surgery. 3. Both these surgeries can be done at the same time and I'll need to be on crutches for a month (dear Lord help me!). The good news - I'm getting it done and I'll be back to myself in a few months. Woohooo! 4. I have a bulging disc in my back pressing on the nerve root which shoots pain down my leg and to my knee. So I'm seeing a back doctor on Monday and they may give me an injection. No surgery and it isn't too bad. It's probably from compensating for my knee (Which I knew. I could be a doctor). We'll see what her colleague says. She wants to get this taken care of first before surgery. I'm a mess. But at least there are answers. I told her I was afraid I'd go in there and she'd tell me there's nothing wrong. It was the opposite - I have multiple things wrong which explains SO MUCH! Like why I can't walk without wanting to rip my left leg off. I'll admit that I cried after I left and called Mom. I'm not sure why. Maybe a bit of relief knowing what it is and that there's hope for healing. Maybe a bit of sadness that the summer will be about rehab. In the end I will get better and will eventually be able to run along the lake again. It's been a while. I'm getting tired of having to say that on this blog. With Facebook I've gotten to the point that I can't write anything longer than 120 characters without blowing up. I also can't read anything that holds my attention if it's longer than 120 characters. What is this world coming to?! Now that I've unofficially apologized for the abandonment, I have a gift for you. Actually it was more of a gift for me. I had a few photos taken for an agency that specializes in "normal looking people" for print ads featuring "normal looking people." They have a photographer take several photos and then they post them to their website for agencies to browse and see if they want to use you. And by "use" I don't mean anything inappropriate. Or maybe it is inappropriate and I'm naive. Well, maybe so...wait, how much are they paying? I just had my photos posted. They aren't anything special. I'm looking tanner than normal since they were taken right after Hawaii. When did my face get so chubby? Oh yeah, it's called Christmas and no running. It's my winter weight. You have to have some to survive up here in the arctic tundra. One thing Christmas and no running does for me that's positive can be seen here in this photo. Click on my face and go to the second picture. Can you see what's different? That's right - CLEAVAGE! Where did that come from? Holy cow! I wonder if they airbrushed it. I got away with wearing spandex at work today - all day. Some dreams do come true. Treading the fine line between my 20's and 30's I moved to Chicago to "find new playgrounds and playmates" as my dad calls it. The temptation of actually making money as an actress sucked me right into the improv world of Chicago. Of course I've made no money as an actress but I've had a lot of fun trying. And I'm not finished quite yet.